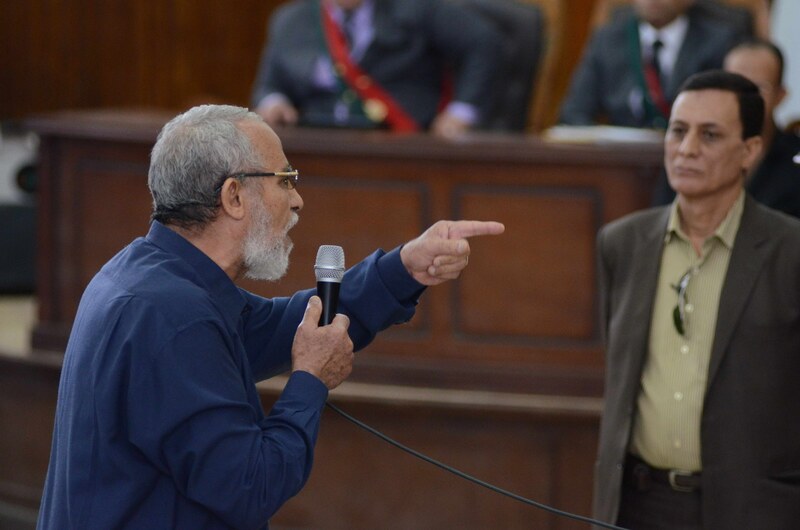 Egyptian Brotherhood’s supreme guide Mohamed Badie (C) gestures as he talks to his judges during his trial in the capital Cairo on May 18, 2014. The Shubra El-Kheima Criminal Court handed 37 others life sentences (25 years in prison) and confirmed death sentences of 10 others. It ordered to pay an EGP 20,000 fine. Those sentenced will also be subject to five years of observation upon release, according to defence lawyer Osama Al-Helw. Among those sentenced to life in prison are Muslim Brotherhood Supreme Guide Mohamed Badie, Freedom and Justice Party Secretary General Mohamed Al-Beltagy, and conservative preacher Safwat Hegazy. Badie was convicted on Saturday of involvement in deadly protests. He had already received death sentences in two other cases in a heavy-handed crackdown against his group following the military ouster of Egypt’s first democratically-elected president, Mohamed Morsi on July 3, 2013. Of the 10 defendants that were condemned to death last month in the same case, whose sentences were confirmed, an Islamic cleric has since been reportedly arrested. Another defendant was sentenced to three years. This is while the Egyptian military-installed judiciary has provoked international outrage over mass death sentences for more than 200 people in several mass trials. During the Saturday hearing, presiding Judge, Hassan Farid, claimed the defendants were involved in violence and murder during protests last July after the army, led by now President Abdel Fattah al-Sisi, overthrew Morsi. Hundreds of Muslim Brotherhood’s supporters have been killed in clashes with security forces and nearly 15,000 have been arrested in persisting protest rallies since Morsi’s forced ouster. The Brotherhood has been also declared as a “terrorist movement,” and most of its leaders, including former president Morsi, have been imprisoned.